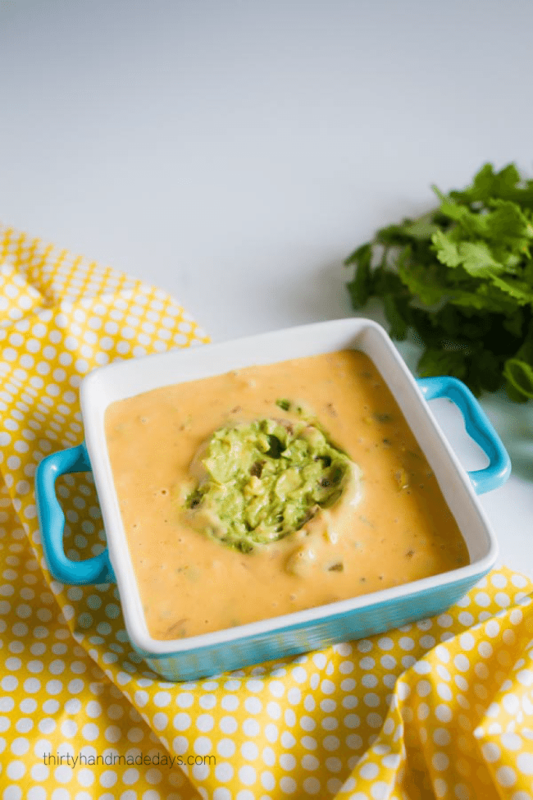 You need to look no further for the most incredible cheese dip you’ve ever had because I have it for you. 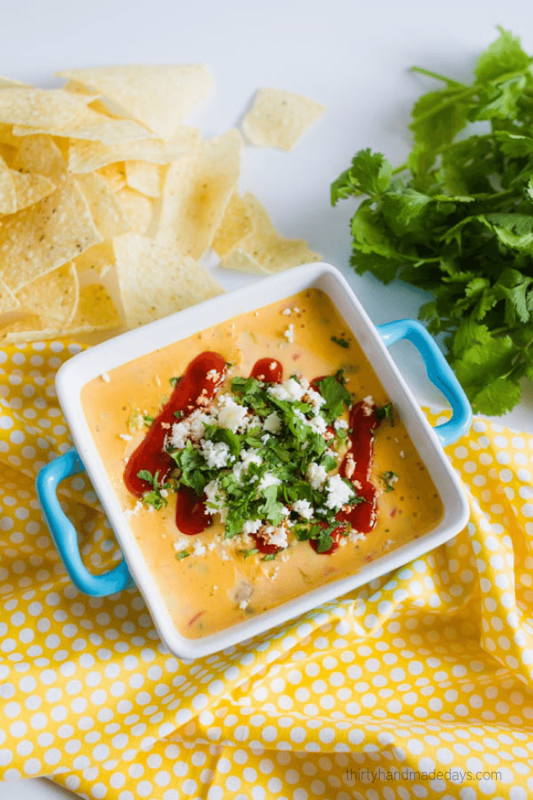 It’s a Copycat Torchy’s Queso dip recipe and it is straight from heaven. I grew up in the San Diego area. We lived in the land of amazing Mexican food. I didn’t know how good I had it until I moved away and now nothing beats a Rico’s bean and cheese burrito. 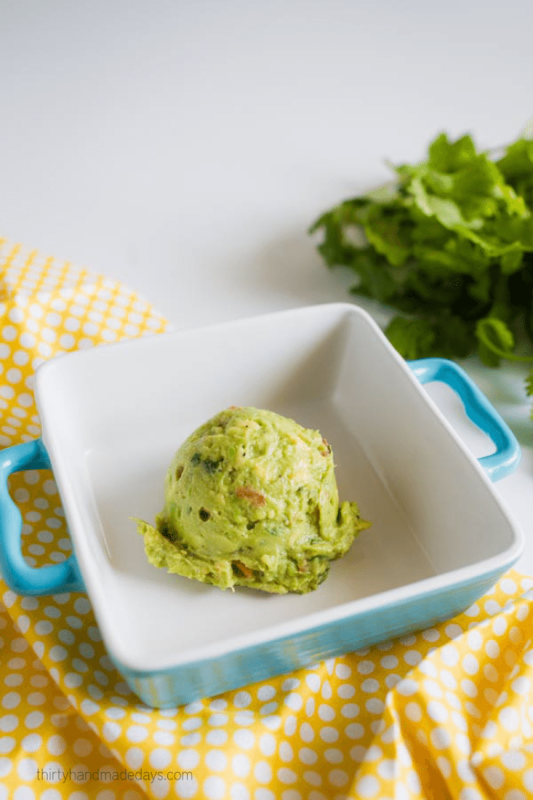 My brother and his family moved a few years ago to Austin, Texas – land of every kind of food. I finally got to visit him this winter and he casually mentioned that we needed to go to Torchy’s on the way to the airport. So we did. It was life. changing. Dramatic? Probably. But oh my word every bite was incredible. My absolute favorite was the queso and chips. I think I said “Oh my gosh, this is so good!” at least 5 times. And I meant it. I couldn’t help but share the amazingness on Instagram. It’s not hard to recreate at home if you have the right ingredients. I wish we lived close to a Torchy’s or that they would open one in my area. But for now, this will definitely fit the bill until my next visit to my brother’s house. Major thanks to Megan Brunson for this recipe that was given to my brother. And to my sister for making it for Easter. It made me weak in the knees…. 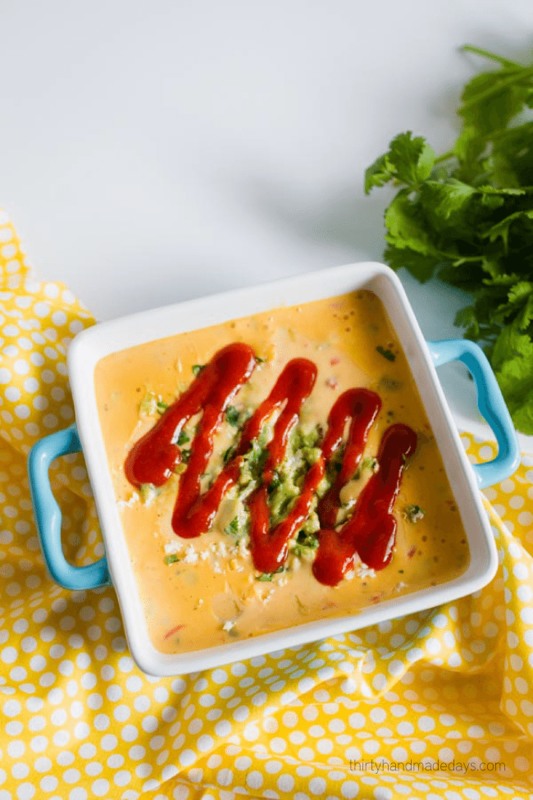 You need to look no further for the most incredible cheese dip you've ever had because I have it for you. 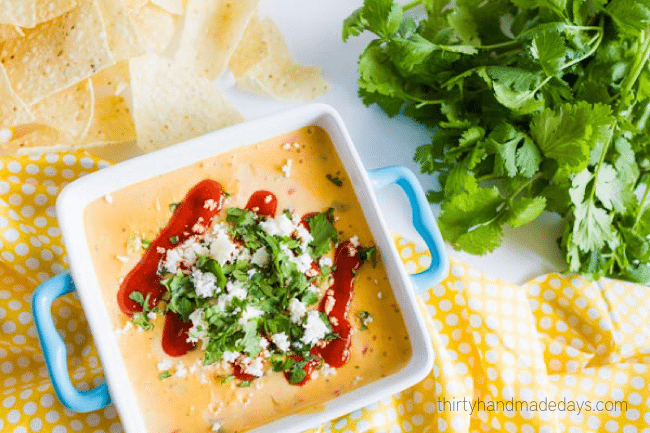 It's a Copycat Torchy's Queso dip recipe and it is straight from heaven! Mix together over medium flame until melted and hot. 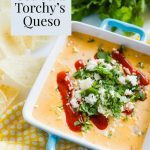 Top with guacamole, cilantro, crumbled or shredded queso fresco and Torchy's Diablo sauce. 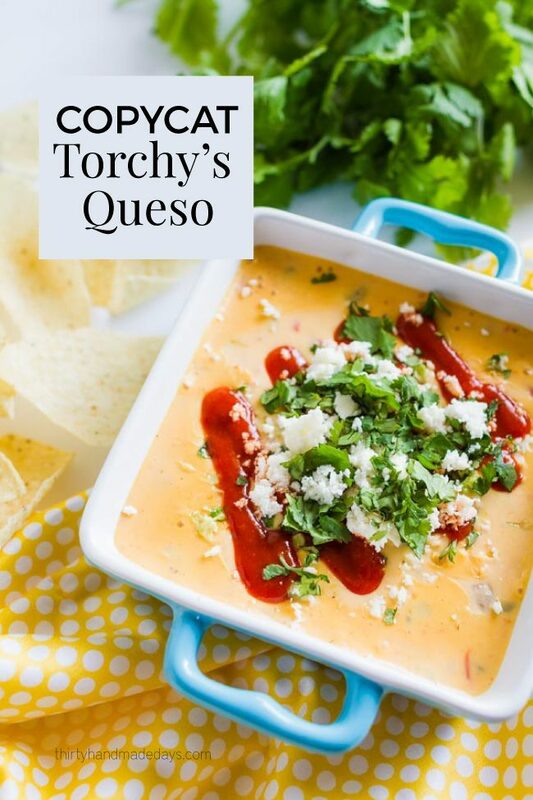 If you don't have access to Torchy's sauce, add your favorite hot sauce. Normally you put the guacamole in the middle and then pour the cheese sauce over it. Then top with the queso fresco and cilantro. It’s good queso, definitely. It’s not quite Torchy’s, but it’s getting there. I thought the cheese ratio was a bit high, so I added more sour cream, salsa and chilis. That got it a lot closer. how did i miss that you came to Austin?!? I know visiting family doesn’t lend itself to friend time, so I’ll try not to cry about it. Torchy’s is pretty amazing. I went for 36 hours in December. It was a crazy whirlwind!! (I was there for my niece’s baby blessing) Otherwise I would’ve reached out to you. I’m obsessed with Torchy’s! We went on the way to the airport and I’ve dreamed of it ever since. Next time! I just moved down the road from Torchys and I have been wanting to try it so badly for a while now! You just confirmed that its as amazing as it sounds! 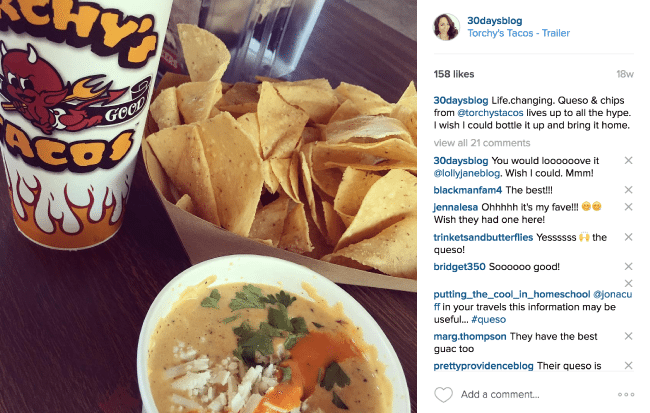 I hope you got to make a trip to Torchy’s and loved it as much as I did!